The game comprises a deck of 60 cards and a set of rules. The cards are good quality and have a nice feel to them. The illustrations are simple and the icons and text are clear. Each card shows one of sixteen different types of robot (“Bots”); its Power, the amount of damage it does and can receive; and details of any effects it causes when played. The rules sheet is well laid out and contain lots of information, although a few more illustrations showing how the game plays might have been helpful. That’s not to say the rules aren’t clear but illustrating how attacks work on a Stak would have made things easier. The idea behind the game is very simple: Try to reduce everyone else’s stack of cards (their Stak) to zero while trying to stop others from doing the same to you. Each player starts with a Stak of 9 cards with only the top card turned face up. They also start with a hand of two cards and the remaining cards form a face down draw deck. On a player’s turn, they draw a card and can then carry out any number of three different types of action in any order. Firstly, you can “Play” a card from your hand to the top of your Stak making sure you can still see any face-up cards below it. Certain cards have effects that trigger when you play them; otherwise the card stays on your Stak until you scrap it or it is destroyed. Secondly, you can “Scrap” (i.e. discard) a card from the top of your Stak or from your hand to the Scrapheap (discard pile). You may need to do this if you can’t destroy an opponent’s card (or choose to do it for tactical reasons), because at least one card has to be added to the scrapheap each turn. Finally, you can “Attack” with the top card of your Stak. You can attack multiple times with the same card but only use that one card on the same turn. Attacking involves doing damage to the top Bot of an opponent’s Stak equal to your card’s power and receiving damage equal to the power of the opposing card. Any card receiving damage greater than or equal to its power is destroyed. If your Bot attacks multiple times, its attack is always at full power, while the damage you receive accumulates until your Bot is destroyed or you end your turn, at which point you fully heal. As soon as a player’s Stak is exhausted, they are out of the game and the last player standing wins. 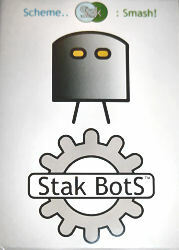 Stak Bots is a game with a very simple rule set and, when you first start, it appears pretty mindless – higher power cards are stronger so play those to destroy weaker cards and protect your own Stak. However, it is more about trying to combine the entry effects on cards with the cards already on your Stak that is the key to the game. And once you start to see these linkages, the game becomes more interesting. That said, there is some randomness in the cards you get in your initial Stak and the card you draw each turn so you can lose out just by virtue of the cards you get. However, the weaker power cards have better entry effects and so you can still feel you’ve got a shot. In addition, the game is quick so even if you do have a bad hand, particularly if it’s just a two player game, the agony isn’t prolonged too much and you can soon go for a rematch. I like it as a quick robot-bashing hand-management game. It’s not the most sophisticated of games but it doesn’t pretend to be and, in terms of what it aims to do, it does it pretty well.